The NORDET and SUROÎT vessels are ROPAX vessels with a capacity of 188 passengers and 18 vehicles. The crew of each ship is composed of 8 qualified sailors. These ships make regular connections between St. Pierre, Miquelon and Fortune. 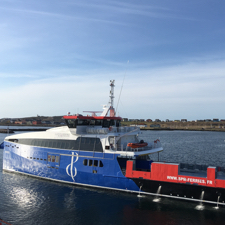 New this year, SPM Ferries travels between Fortune and Miquelon non-stop in Saint-Pierre to facilitate transportation to Miquelon from Canada and twice a week in high season. 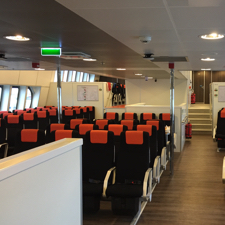 Starting in July, you will find a hot and cold drinks counter, as well as sweets, sandwiches and cakes on board. The SPM Ferries team wishes you a pleasant trip aboard the NORDET AND SUROÎT ships. 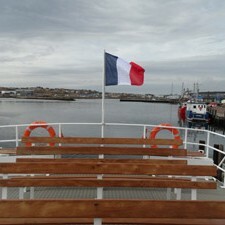 The Jeune France is a passenger ship that can accommodate up to 120 passengers. It requires a 3-member crew. 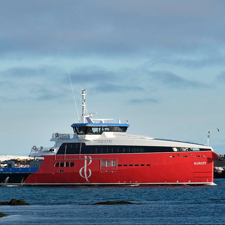 This ship provides service between Saint-Pierre and Langlade. There is no dock on the island of Langlade. 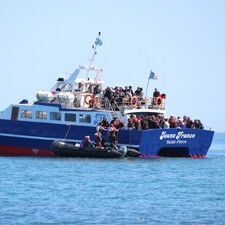 Passengers and their luggage are brought by zodiac to the shore. There is no food service provided aboard the ship. Passengers are invited to take advantage of the outdoor seating to enjoy the scenery. 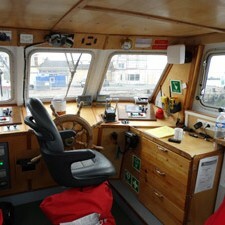 This ship is also used for guided tours and sea cruises. An authentic crossing awaits you!